The LRSA has a really neat temp probe on the Lehigh upstream a bit from Jim Thorpe. You will need log in to access the data, but once you get to the input page, there is a plethora of information available. 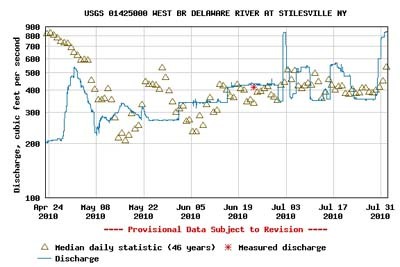 For us anglers, we usually focus on water temp, which is obviously available, but there is also a bunch of other data points such as DO, PH, Turbitity, Specific Conductance, etc. This is all real-time data too. Good stuff. Check it out. Dinks galore! The small fish on the West Branch are feeding with reckless abandon. Even in the higher water they are looking up. This is good, since that means there are bugs, but the larger fish were just not showing themselves. In the way of bugs we found quite a few olives and a smattering of sulphurs in the afternoon to early evening hours. We did throw streamers from time to time, and while we did move some fish and landed a couple - - none of the landed fish were pigs! The only pigs we saw and managed to move, were tight to the bank and blew up on the streamers. They did not seem too committed overall though at eating. 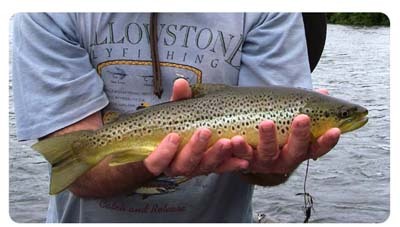 One cool sight was watching an enormous brown come out of the depths to follow in a 10" hooked trout all the way to the boat. It never looked like it tried to eat the smaller fish, but I am sure it did scare the shish out of that little guy. Overall...for August the fishing was not too bad. Well it started in late July, and has not stopped. It is a safe bet that this higher release will continue for the foreseeable future. 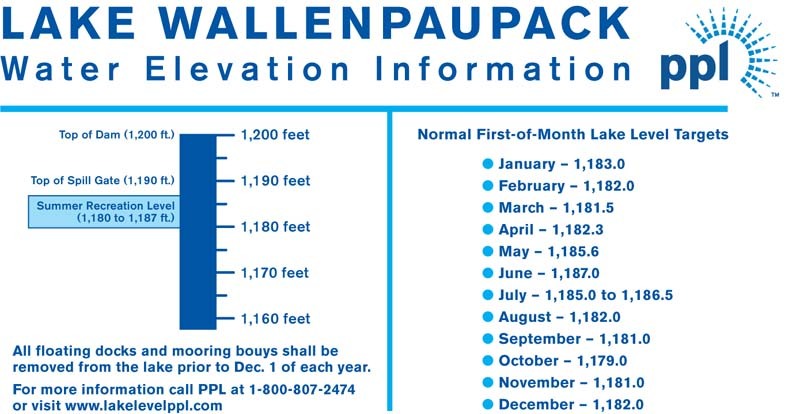 Reason being is rainfall for the most part looks spotty at best, and from what it looks like, Wallenpaupack is already at its September 1 target level. With this being the case, PPL can not generate and draw the lake down anymore. 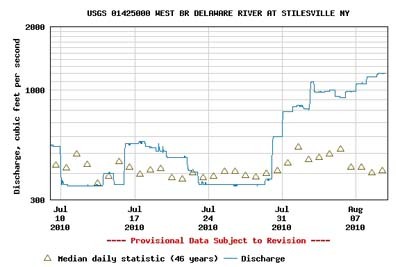 So with Wallenpaupack and Mother Nature both out of the equation, this only leaves Cannonsville as the reservoir of choice to sustain the all important 1,750cfs Montague minimum flow target. It all plans out as scheduled, we hope to be on the system this coming up weekend. The last 100 days of releases from Cannonsville are charted to the right. As you can see the releases have been sparse at best. Currently, as of this past weekend, we are looking at some of the highest releases we've seen all season. So for pretty much all season the fish have been starving for water. That said, the release from Cannonsville is and has been considerably higher than inflow. One thing is for sure, whenver we see that next big rain, it will be time to bust out the big stuff. It has been a long time since we've seen the West Branch go high and off color, and when it does, watch out. The bite will be off the charts. You can bank on it.